Parking: Visitors to the Central Library may park for free in the lot directly across State Street. A few accessible spaces are located in front of St. Michael’s Cathedral (church next to the Central Library) on State Street. Accessible parking is also available in the small lot between the Smith Art Museum and the Science Museum (enter via the driveway to the right of the library, next to the Cathedral). *Note: The Central Library ramp entrance from the Quadrangle is currently inaccessible. Please use State Street entrance. Children: Six internet computers. Each session lasts 30 minutes. Children may have two sessions per day. Headphones are provided. Computer Lab: The computer lab on the lower level is reserved for computer classes. Connect to WiFi: The Central Library provides access to WiFi for your personal device. Before you connect please read our Computer Use and Internet Access Policy. To connect close all open internet pages and browsers on your device. Navigate to our WiFi settings and choose Library Public Hotspot. Your device should attempt to connect but will not be able to until you open a browser and type in the web address https://www.springfieldlibrary.org. At this point you will be redirected to the policy acceptance page for the Springfield Library Wireless Network. Read the acceptance terms and Click to Accept. If you have problems reaching the acceptance page you may try these links- https://www.bit.ly/CL_Wifi or https://cm8200.cwmars.org/registration/scmainlogin.html . Once you have accepted the terms close your browser then reopen it and you should be connected to the WiFi. Problems? Please ask a Librarian. Fax Service: Fax service is available in Wellman Hall on the second floor of the Central Library. There is a $1 per job charge for a traditional fax. We cannot receive faxes. There is no charge to scan your document to an email address, USB, tablet or smartphone. To scan to your smartphone you must have a QR code app. Mobile Printing: You can easily print on the Central Library’s public printer during library hours from your home computer, laptop or mobile device. Imagine that! You don’t have to be in the Central Library to print but you must pick up the print job on the same day during our open hours. Stop by Wellman Hall at the Central Library on the same day during our open hours to retrieve your print job. (Note: The Central Library is closed on Fridays.) Black and white only; 15 cents a page. Consult a staff member for assistance. Here is a list of supported file formats in a pdf file. 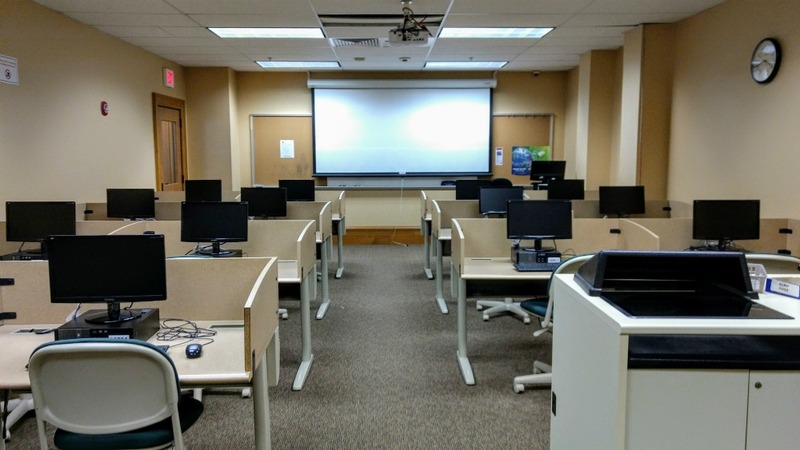 The Community Room and Computer Lab on the lower level are available to the public by application when this rooms are not needed for library purposes. 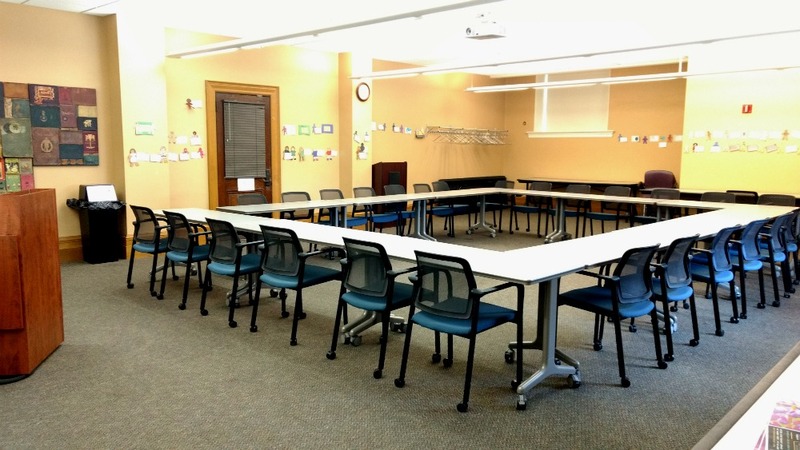 The rooms may be reserved for use by educational, civic, cultural, and governmental groups. 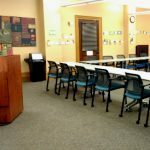 Visit the Meeting Room page for information about booking the Community Room or Computer Lab, to review our meeting room rules and policies, and submit a meeting room request. The Early Childhood Resource Center (ECRC), consisting of books and other resources especially appropriate for teachers and caregivers working with young children, is housed in the Children’s Room at the Central Library. The ECRC is funded by the Massachusetts Department of Early Education and Care (DECC). The Springfield City Library is a part of the Foundation Center Funding Information Network, a nationwide network of libraries, community foundations, and other nonprofit agencies which provides visitors with free public access to grantmaker directories, books on fundraising and nonprofit management, and the Foundation Center’s electronic databases. The area’s print collection is kept at the Central Library. The Central Library boasts large and varied collections, free wifi, and Internet access on public computers, plus many programs for children, teens and adults. Children’s storytimes, book groups, and free computer classes are among the most popular. PDF document of the Central Library floor plan. Since its opening in 1912, the Central Library, a “center of intellectual life,” has given entrance to the State Street corridor. Solidly built of white Vermont marble with immense rooms and corridors, this library has a history of serving working people, at one time open 365 days per year! More than a collection of books and materials, it is an impressive yet inviting community-gathering space. The original 1871 red brick library building, temporarily and ingeniously moved back 200 feet while the current building was under construction, is long gone. Today’s building, an Andrew Carnegie Library, was placed on the National Register of Historic Places in 1974. 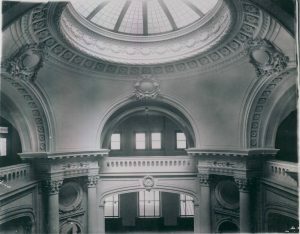 The Rotunda was restored to its original elegance in 1998; the building is on the State Historic Register and is part of the Quadrangle-Mattoon Historic District in the City. Also solid is the history of the men and women who have guided the library. In 150 years only eight library directors have preceded the current director, Molly Fogarty. For more information about the history of the Central Library, download our brochure. Check out the new DVDs on order for the Springfield City Library. Place your hold now!